Many of us grew up watching the Walt Disney TV shows and movies that introduced all those princesses, heroes, and rogues that we cherish into our old age. In “Disney on Ice,” larger-than-life characters like Mickey Mouse and his gal pal Minnie swirl across the ice, singing and acting out updated stories. “100 years of Magic,” which began in 1999, is the longest-running show in the “Disney on Ice” series and one of two shows currently touring Canada. Performer Kirstie Nelson from Canmore, Alberta, plays four to five different characters in the 90-minute show, each segment of which features a different group of beloved characters who sing some of the more famous songs from their movies. “Everybody loves those characters and it’s really cool to see that,” says Nelson, who’s been skating with “Disney on Ice” since 2013. The show starts with Mickey, Minnie, Goofy, and Donald Duck seeking ideas on how to make a movie. They go over segments of various Disney films to get some inspiration. You see Pinocchio sing “When you wish upon a star” while characters from “Frozen” sing “Let it go!” among others in their five-song repertoire. The Lion King is also there, along with Aladdin, Beauty and the Beast, and many others including several princesses. Nelson says she was a “Disney fanatic” growing up and aspired to be like some of the characters she saw. 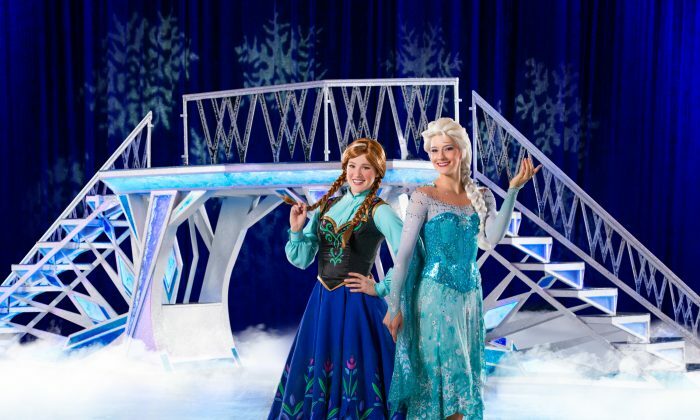 Walt Disney shows have been around since the 1920s and so the “Disney on Ice” shows draw people of all ages. Children stand up and dance and sometimes sing along with their favourite characters of the moment. Everybody can relate to something with them. They have good messages, good values. So what is so compelling about Disney movie characters that give them enduring likeability that few others can match? Some would say it’s just good family entertainment. Another factor could be the integrity demonstrated by the characters. Many face adversity and yet manage to rise above it and even want to help others. Embodying these beloved characters, and seeing how they touch people’s hearts, is one of Nelson’s favourite aspects of the tour. “That’s one of the main parts that I love about this job. You’re such a role model to these kids and they really look up to you because you may not be in costume but they know that was you. You’re that character,” she says. Audiences vary from city to city so you might expect a different response from each group of people. However, Nelson says that every crowd gets excited when Olaf the snowman from “Frozen” comes on the ice. The same goes for when the music from “The Lion King” starts up. “Everybody loves “The Lion King”—that music gets people every time,” she says. The other visually engaging Disney-inspired show touring Canada right now is “Dare to Dream,” which celebrates 75 years of Disney princesses such as Rapunzel, Snow White, and Cinderella among others.